Kick off the football championship with Football Touchdown Cupcakes. 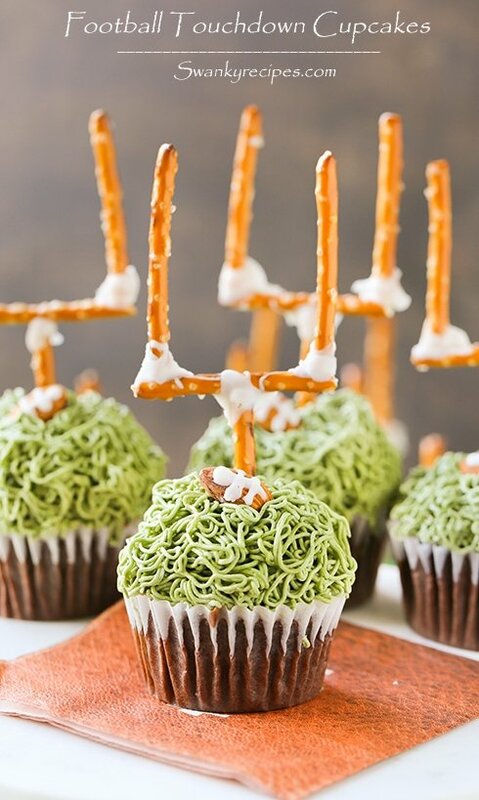 Rich chocolate cupcakes with green frosting, frosted almonds and a pretzel stick touchdown. 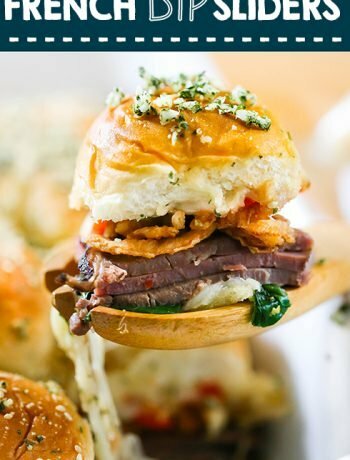 Make this for the next game day party. 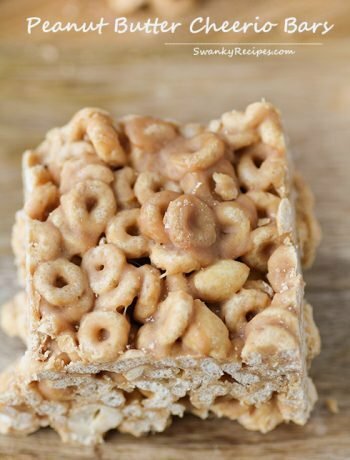 This year, I’m featuring a few simple snack options as well as a fun football inspired dessert. I’ve included summer sausage, cocktail bread, cupcakes, Snyder’s of Hanover® Pretzels and Emerald® Nuts. I love that this football spread only takes a few minutes to prepare. To make this recipe, start by chopping baking chocolate. Combine it in a small bowl with hot water and cocoa powder. Stir to dissolve it then place it in the refrigerator while preparing the rest of the cupcake batter. In a medium bowl, combine eggs, vinegar, oil and vanilla extract. Whisk mixture and set aside. In a medium bowl, combine bread flour, salt and baking soda then stir to combine. Pour the cooled chocolate into the egg mixture. Whisk mixture then pour the dry ingredients into the wet. Whisk or beat mixture for about 1 minute. Line a cupcake pan with liners. Pour batter into each cup; filling it about 3/4 full. Bake for 17 minutes then allow cupcakes to cool completely. 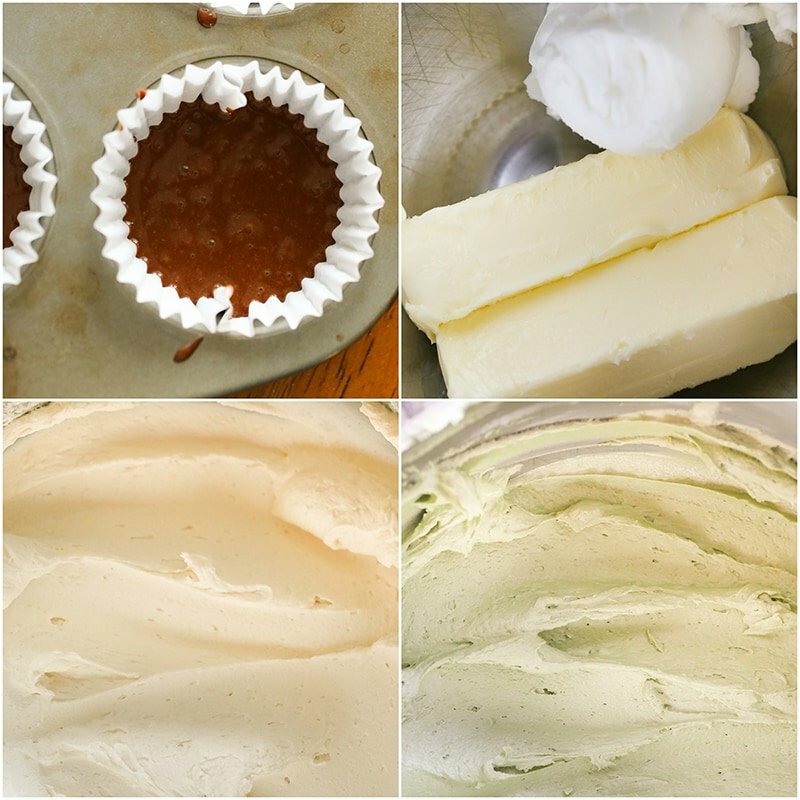 To make the frosting, combine softened butter and shortening in a bowl fit with a mixer. Beat mixture until light and fluffy. Beat in salt, vanilla extract and powdered sugar. Slowly add milk then beat on medium-high speed for 5-10 minutes. Beat in green food dye. Fill pipping bag with frosting and pipe it onto each cupcake. While the men are watching the game, I’m usually in the kitchen snacking. However, with the championship just weeks away, I’m getting prepared ahead of time. 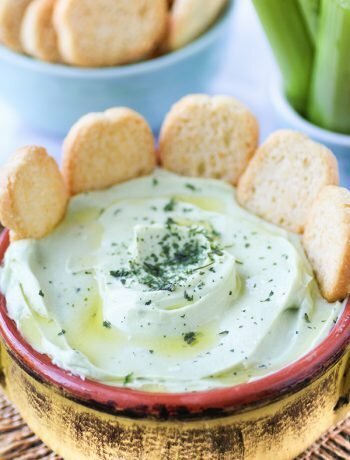 While planning the perfect Game Day party, I’ve discovered that easy snacks are the way to go. However, I wanted to make something special for game. These cupcakes are pretty easy to make and can be made ahead of time. 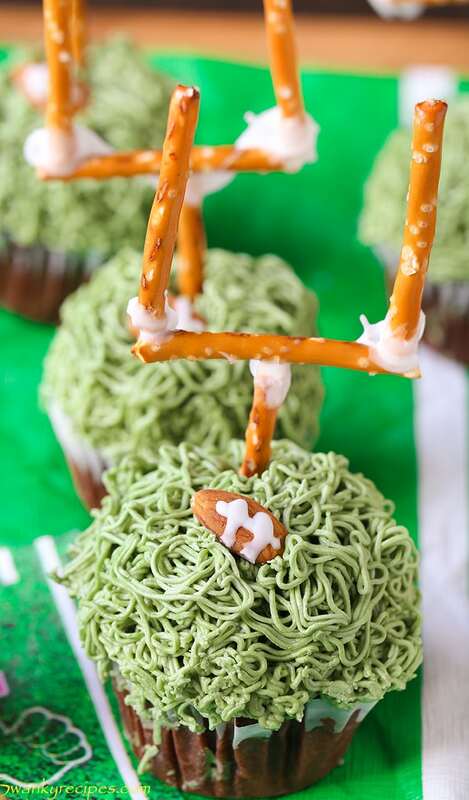 To make the pretzel field goals, dip pretzels into food glue. Line them up to form a touchdown (pictured above) goal. 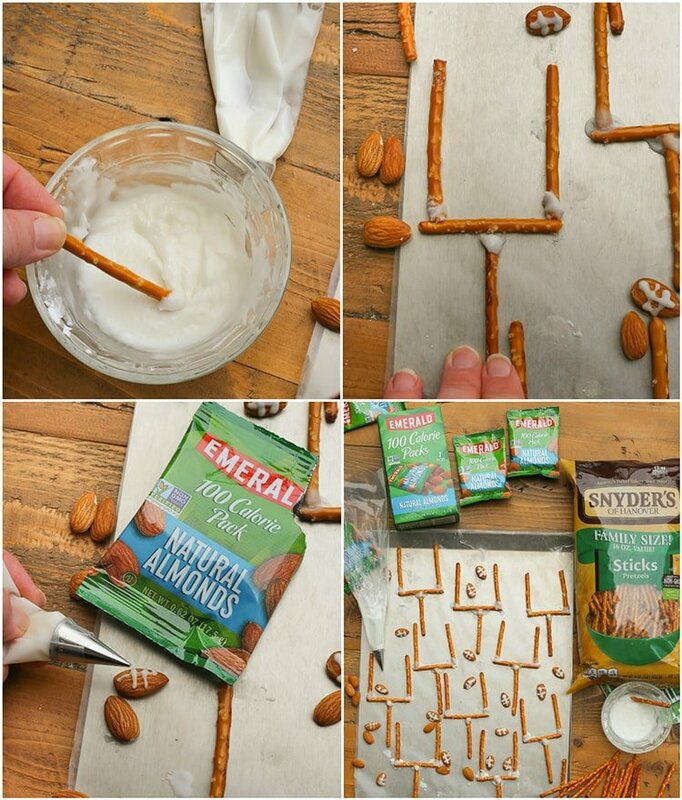 Finally, use the powdered sugar glue recipe to pipe football lines onto each almond. Stick the bottom of the pretzel stick into each cupcake. Top with almond. 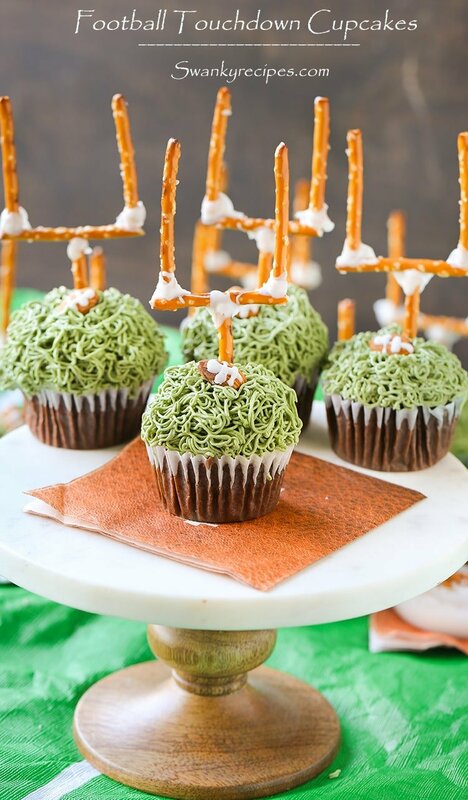 Snyder’s of Hanover® Pretzels and Emerald® Nuts really take these chocolate cupcakes to the next level. 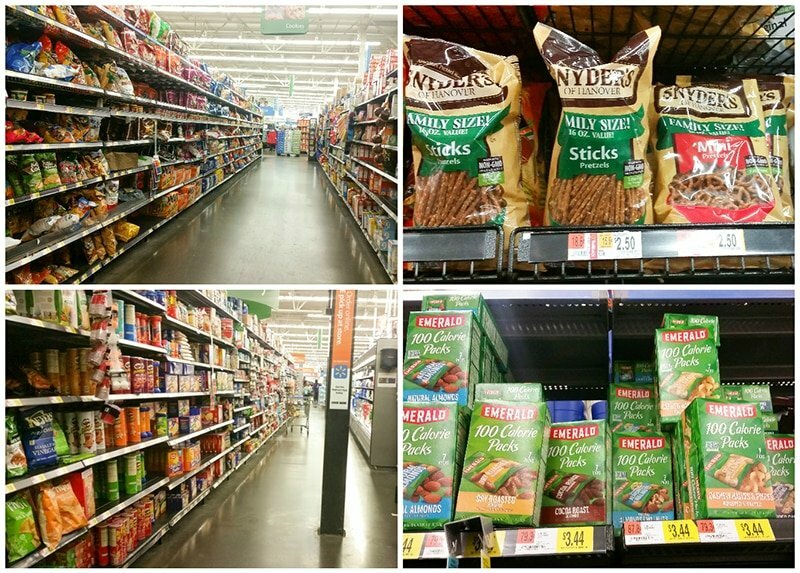 Simply head to Walmart® and be sure to look for the nuts in the snack aisle. The pretzels can be found in chip aisle. 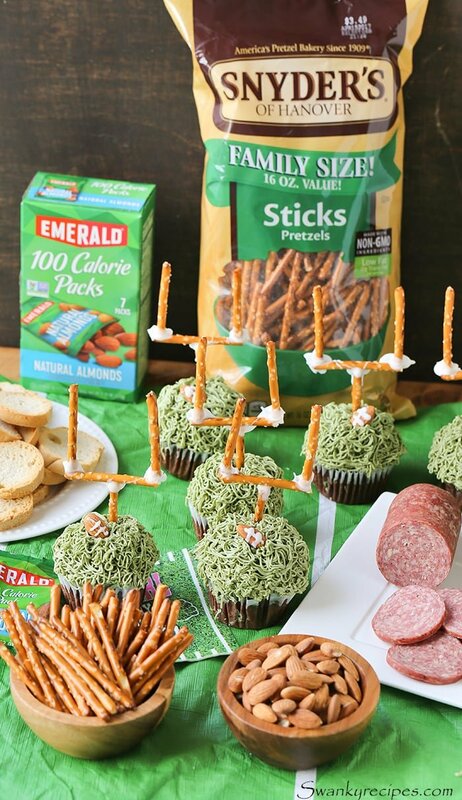 What are some of your favorite snacks to serve on Game Day? Preheat oven to 350 degrees F. Line muffin tin with 12 cupcake liners and set aside. Heat water in microwave for 1 1/2 minutes. In a small bowl, combine chopped chocolate and cocoa powder then pour hot water over the top. Whisk until smooth and place in refrigerator for 20 minutes or place in the freezer for 10 minutes. In a small bowl, combine oil, vinegar, eggs and vanilla extract then whisk for about 1 minutes. In a separate medium bowl, combine bread flour, baking soda, salt and sugar then whisk to incorporate well. Once chocolate has cooled, pour chocolate mixture into vinegar/egg mixture and mix well. 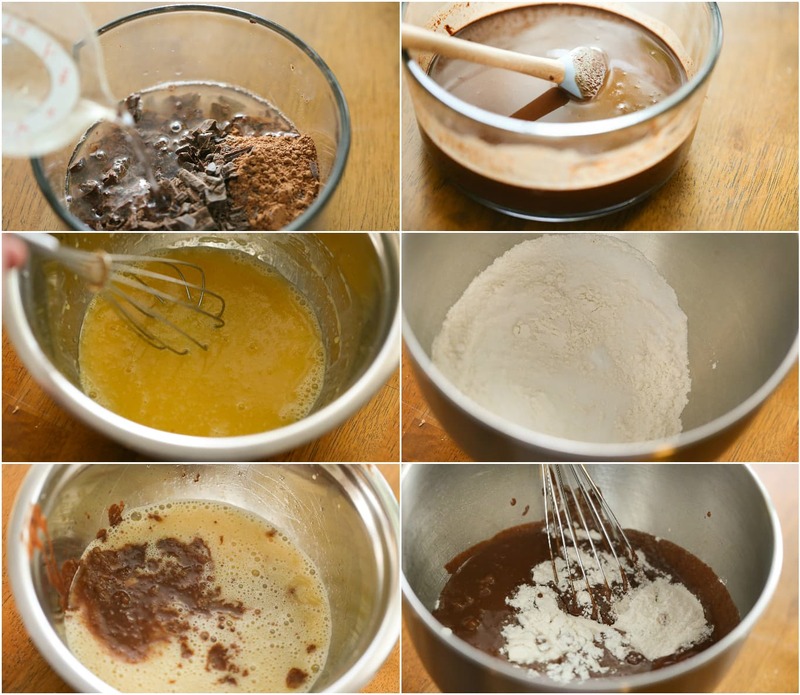 Pour chocolate and egg mixture into dry flour ingredients. Beat on low or whisk batter until it is smooth; about 1-2 minutes. Pour chocolate batter into cupcake liners filling it about 3/4 full. Bake for 17-19 minutes or until a toothpick inserted into the center comes out clean. Allow to cool before frosting. In a stand mixer fitted with a paddle attachment, cream butter and shortening together until light and fluffy (about 3 minutes). Pour in salt and vanilla extract while beating on low. Mix in powdered sugar. Turn mixer off and add the meringue powder. Mixture will be thick. Continue to mix until incorporated. Slowly add milk and allow mixture to reform then turn it up to medium-high speed and beat frosting for 5-10 minutes, until light and fluffy. Add green food dye and beat well to combine. Fill piping bag and pipe frosting onto cupcake. Chop 1/2 inch off 30 pretzel sticks, making them all the same size. Chop 1/2 inch off 15 pretzel sticks, making them all the same size. Chop just the tips off 15 pretzels. This will stick in the cupcake. Mix confectioners' sugar and water in a small bowl. Mixture will be thick. Lay a piece of wax paper down. Dip the ends of 30 pretzel sticks into the mixture. These will connect to the horizontal bar. Push them flush against the rod. Next, dip the slightly chopped end of the pretzel into the sugar glue. Connect it to the horizontal rod. This will form the touchdown goal. Allow to dry overnight. Mix confectioners' sugar and water in a small bowl. Stir to combine. Place into pipping bag with the smallest round tip available. Draw football lines on almonds. Pip frosting onto cupcake. Stick end of pretzel into cupcake. Top with football almond. These are so cute. What a great idea for all the football parties! These are so cute! Perfect for Super Bowl!! These cupcakes look sooo cute 🙂 They are a true masterpiece to be hones! Great job! Would love to be invited to your football watching party 😉 Have a great weekend Jessica! These are absolutely adorable! You’d be a hero at our Super Bowl bash with these cupcakes!